Engraved by W & G Cooke from a drawing by J Britton and taken from The Beauties of England and Wales, published by Vernor & Hood, London, in 1804. The Merry Maidens stand at the centre of a large complex of prehistoric monuments which include the Tregiffian Entrance Grave, the Pipers, and other menhirs, holed stones and barrows. There are also references to a further stone circle close by. A recent attempt to steal one of the stones, luckily this was spotted and stopped before any real damage was caused, as well as the 'napalm' attacks on the Mên-an-Tol and Lanyon Quoit have necessitated the institution of a form of prehistoric neighbourhood watch, and mindless damage such as this makes us all aware of how precious these vestiges of our past are. The excuse given for the fire attacks was that these particular monuments are fake and are no longer in their original positions. This argument could equally well apply to a large number of prehistoric monuments in the country. They change very slowly and take on new and beautiful forms, almost in mimicry of the geological processes which made the stones of which they are composed. Of course the human hand is involved at many stages of the monuments' history, and this is what makes them so precious to us. 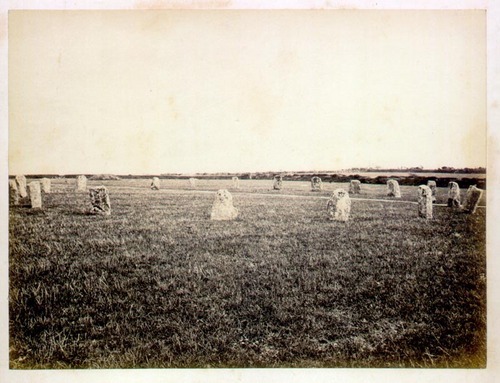 This photograph, one of the earliest examples from the Francis Frith collection, shows the circle from the northwest. 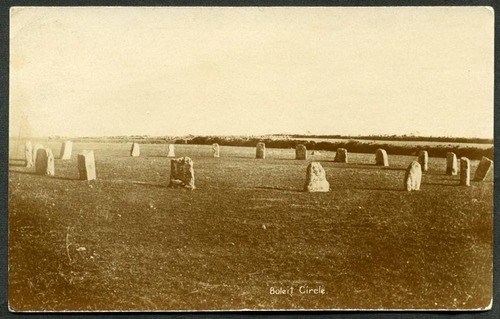 The Merry Maidens is arguably the finest example of a stone circle in Cornwall and is almost perfectly circular, deviating only 7 inches within a diameter of 78 feet. The circle is known to have been restored between the years 1862 and 1869, and this photograph, if the date ascribed to it by Frith's is correct, suggests that the restoration had been completed by 1864. The stone shown leaning on the right of the picture still leans to this day. Image courtesy of and © David Thomas. This rare real photographic postcard by Gibson must have been taken just a few feet to the left of where the photograph by Frith was taken. William Cotton, describing the site in 18271, states that "This circle of stones is in a field at Bolleit, in the parish of Burian, very near the high road, though it is not seen from thence. It originally consisted of nineteen stones, set upright in the earth, at nearly equal distances, in the periphery of a circle, which measures 83 feet in diameter, N. and S., and 72 feet E. and W. There are sixteen stones only now standing, two appear to be lying on the ground in their proper places, completely covered with heath and furze, and a third is wanting altogether. The distances between the stones vary a little, some being 8 feet 4 inches, others 9 feet 6 inches, and some 7 feet 4 inches, apart: their height is about 4 feet. 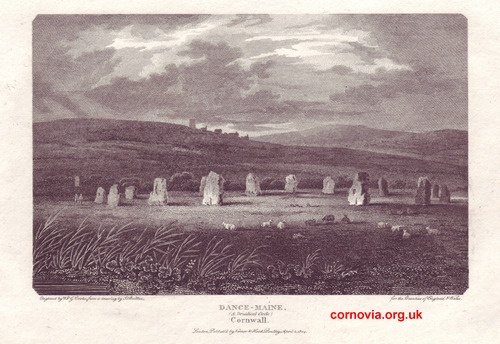 Dance-Maine signifies the Stones' Dance, and is a name derived from a popular opinion, that they were young women so transformed, like Niobe, to stone, for impiously dancing on the Sabbath day. Hence the common appellation of the "Merry Maidens," which distinguishes this as well as other circular temples in Cornwall."